Another highlight of Scotland's musical life comes from the National Youth Choir of Scotland (NYCoS) National Girls Choir. Joined by Claire Jones, the official harpist to HRH The Prince of Wales, Christopher Bell leads performances of Benjamin Britten's A Ceremony of Carols, An English Day-Book—an exciting rarity by English composer Elizabeth Poston—and two contemporary works by Scottish composer Oliver Iredale Searle and Irish composer Stephen Deazley. 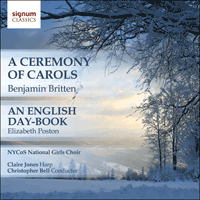 Benjamin Britten’s hugely popular A Ceremony of Carols was inspired by his discovery of The English Galaxy of Shorter Poems and was composed in part while returning by ship to Britain from the United States. It is an unusual setting for treble voices and harp; Britten had intended to write a harp concerto and so had been studying the instrument. The “carols” are largely the product of fifteenth and sixteenth century writers, most of whom are anonymous. They retain their unique flavour by Britten’s extensive use of old English language. The work opens and ends with the choir processing to plainsong, and the sections in-between deal with the traditional stories surrounding the birth of Christ. The piece in its entirety shows Britten’s mastery of choral music, with each movement in contrast with the next, ranging from the plangent solos of That Yongë Child and In Freezing Winter Night through the smooth polyphony of Balulalow and There is no Rose to the angularity and dynamism of As Dew in Aprille and This Little Babe. A Day-Book is a diary or a journal: a book in which to record the events of the day. In this piece, Elizabeth Poston has linked together a sequence of sacred and profane poems in which the small-scale happenings of the day are symbolically identified with the procession of the seasons of the year and, by further augmentation, with the span of life itself. The contrasting conceptions of faith and superstition, of birth and death, of dawn and dusk, contribute alike to a serene, philosophical interpretation of our earthly destiny in terms of lyrical song. The sequence of poems is cyclical, beginning and ending with the bellman’s (or town crier’s) curfew call: “Cover the coal”. Britten’s A Ceremony of Carols is a total masterpiece. Two processions, seven Christmas songs, a delightful interlude and the totally unique colour of upper voices and harp. I have known, performedand loved the piece over many years and each time I perform it, I marvel at its fine melodies and inventive accompaniment. For the same number of years I have been looking for another piece of music for the same combination to pair with it in a concert. In 2009 I was contacted by Brian Davis, a harpist from England. He, too, had been trying to find pieces to pair with the Britten, had compiled a list, and wondered if I’d like to see it along with some music he had collected. Of course I’d be thrilled, was my reply. As I sifted through the contents of the parcel, I came across a substantial score, a photocopy of An English Day-Book by ElizabethPoston (handwritten manuscript). The composer’s name was known to me—Elizabeth Poston wrote a charming and very effective setting of Jesus Christ, the Apple Tree, and she also wrote the score to the TV series Howard’s End! Some research revealed that she worked for the BBC, had made many folk song arrangements and also edited the Penguin Book of Carols. And as I listened to the CD with its hissing sound, its noisy, somewhat scrappy performance, my excitement level was rising. This could really, really, really be the piece to pair with the Britten—a musical treasure hidden for many years! It has been a great pleasure to be part of the process of reviving this piece. The handwritten manuscripts did not always match with the harp part, and there was a lot of consulting and discussing to do. But in the end I am thrilled that the National Girls Choir and I got to work on this wonderful music.